A Coach Kit of parts for the 'Modern' 2000 Darjeeling Coach. Comprising Chassis/Footplate, 2 sides, 2 Ends, Partitions, Seats, Roof. Kato Bogies can be supplied, £39 inc Vat. Kato Bogies £7 pair. 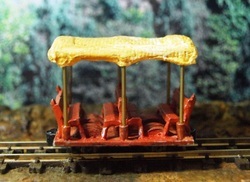 A simple kit of parts of the Darjeeling Trolley. Kit comprises 1 roof structure, 1 chassis, seats can be sourced elsewhere. 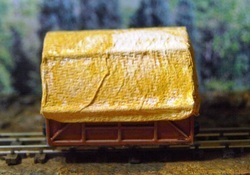 This Wagon Kit can also be made in 7mm scale. Comprise of Chassis / Footplate, 2 sides, 2 Ends, 1 roof.